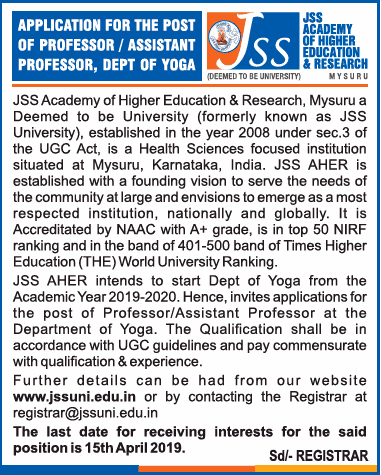 JSS Academy of Higher Education and Research Recruitment 2019: JSS Academy of Higher Education and Research has published a recruitment notification for Professor, Assistant Professor Jobs in Department of Yoga. For these jobs you can apply from 21-03-2019 to 15-04-2019. 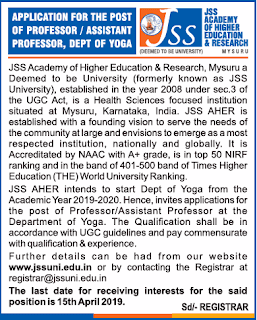 Interested Candidates can send Updated Cv registrar@jssuni.edu.in to the Email-id for JSS Academy of Higher Education and Research Professor, Assistant Professor Vacancies.More Details to see the Official website www.jssuni.edu.in. Required Details like Salary, Important dates, Selection Process, Qualification are given below. Starting Date to apply: 21-03-2019. Eligible candidates can send the Updated Resume to the college Email-id Address. Last date to apply is 15-04-2019.